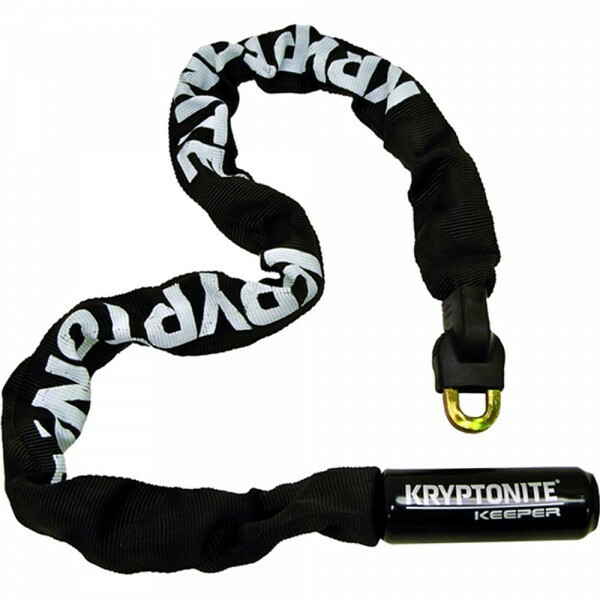 A lightweight integrated chain in the Keeper line of Kryptonite security products. The Keeper Integrated Chain is a hardened triple heat-treated boron manganese steel chain made with 7 mm four-sided links. The Keeper Integrated Chain secures with a new integrated lock head. Chain links are enclosed in a nylon-webbing sleeve to protect paint from scratches. End pin-link design secures the chain with the hardened deadbolt. Offers great holding power against attacks. High security disc-style cylinder is pick and drill resistant. Recommended for use in low crime areas. Comes with 2 ergonomic 'I' keys. The new 'I' key makes opening a disc-style cylinder much smoother. 85 cm Length. Approved to Bronze Sold Secure standard.